Most of us are all too familiar with the many cigar-related gadgets on the market. From cigar holders for the golf course to unique and expensive lighters, cutters, and humidor accessories, the manufacturers and retailers of these products would have us believe that no cigar enthusiast is complete without gadgets. Nothing could be further from the truth. But I’m willing to consider utilitarian products that I can envision being helpful on a routine basis—especially if they’re inexpensive. The new Screwpop Cigar Punch falls into this category. I’ve been using one for the past couple of weeks (provided to me by Screwpop, in the interest of full disclosure), and I’ve found it to be a decent addition to my keychain. 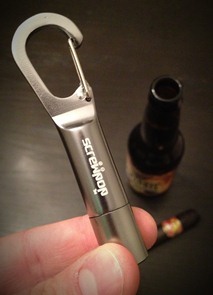 The Screwpop Cigar Punch is a bottle opener/punch cutter that securely clamps around a keychain (or pretty much anything else—like a clip on a golf bag, a belt loop, or the eyelet of a zipper). It has a rust-resistant body comprised of aluminum so, while it will add bulk to your keychain, it certainly won’t weigh you down. As a bottle opener, it works perfectly. To reveal the cigar punch, simply unscrew the aluminum cap. The punch itself is sharp and functions just as you’d expect. I’ve tried it on a number of cigars of varying size and wrapper type and found no problems. Just like any other punch, though, you wouldn’t want to use it on torpedos. My only concern with the product is the possibility of losing the screw cap that protects the punch. Once separated, there’s nowhere to affix the cap as you’re punching the cigar. Obviously, if you were to lose the cap, you may not want to keep Screwpop on your keychain or elsewhere since the sharp cutter will be exposed. Accidents happen. That said, I can recommend this product to cigar enthusiasts who prefer punch cuts and also have an affinity for beer. And at only $7.95 from Cigars International, you won’t have to break the bank to give it a try. For anyone interested, the pairing in the background of my photo is Metropolitan Brewing Company's Flywheel Lager with a La Gloria Cubana Serie N JSB. How do you pop the puncher after use? You screw off the bottom aluminum cap to reveal a punch cutter. Then you use the punch to penetrate the head of the cigar to enable a draw. After you punch the cigar how do you get the bit of cigar out of the puncher when it has no opening in the back or something to push it out? !